Today's victim is a real tough guy. Not only does he wear camo, he also got a Hebrew tattoo labeling himself as a warrior. Or at least warrior in Hebrew was the intention... The result is just a sad gibberish tattoo. It's interesting, we've already seen a warrior girl who ended up with a strange tattoo, now we also have the guy version. This tattoo almost looks like a case of keyboard misuse (switching the keyboard to Hebrew and typing in the English word), except it's not consistent with the standard English-to-Hebrew keyboard mapping. I have no idea how he got it, do you? Now, below is the correct Hebrew spellings of "warrior". 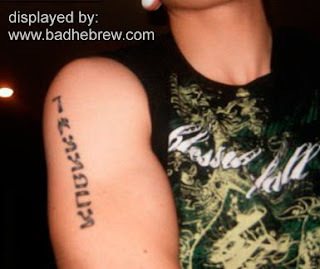 You can see that it looks nothing like the random gibberish this guy got inked on his arm. Yes, warrior is a gender specific word in Hebrew, don't say you weren't warned! w must have overflowed into the sofiot area in whatever list or chart he was consulting. Good eye, Winter, and I second the 'awesome'. Not many people know, although most nitwits probably suspect, that we made up our alphabet by simply listing the English version of the Latin letters and making up new squiggly characters for each one in order, ha. I've seen plenty of brain-damaged tattoos, but this fellow raises it to new lows. And Typo, you knew all the time, right? Oh, I really can't take the credit for cracking this mystery. All credit belongs to Winter, it really is a nice catch! I am happy, though, that we now know just what went wrong with this tattoo. Very creative, this one. Quick, someone go tell him it actually spells 'DERRIERE' in Hebrew, and had he located it somewhere else he could sit down on the battlefield and no one would ever see it. How do you even know what it was supposed to say? How do you Say "Gods Warrior" or "Glory to God" in Hebrew like spelled as well i would like it as a tattoo i am in the navy and i am a aviation rescue swimmer so i risk my life daily but my heart belongs to God and i would like to give honor to him as my first tattoo if you can help me please do thanks!